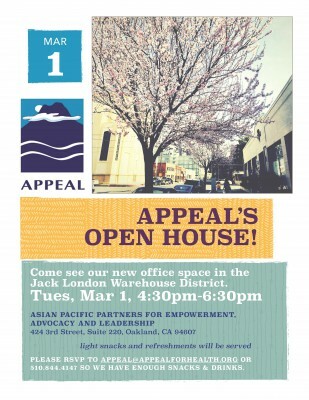 We’re excited to invite all of our partners, friends, and neighbors to our Open House to celebrate APPEAL’s recent move to new offices! The Open House is scheduled Tues., March 1, 4:30 – 6:30 p.m., 424 3rd. St., Suite 220, Oakland, CA, 94607 – in the Jack London Warehouse District. 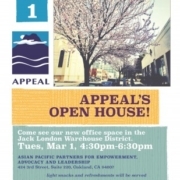 Stop by to chat and check out our new digs, as well as light snacks and refreshments. Please RSVP to [email protected] or (510) 844-4147.